Mechanical energy is produced when heat is carried upward by convection in the atmosphere. A process for producing a tornado-like vortex and concentrating mechanical energy where it can be captured is proposed. The existence of tornadoes proves that low intensity solar radiation can produce concentrated mechanical energy. It should be possible to control a naturally occurring process. Controlling where mechanical energy is produced in the atmosphere offers the possibility of harnessing solar energy without having to use solar collectors. The Atmospheric Vortex Engine (AVE) is a process for capturing the mechanical energy which could be produced when heat is carried upward by convection in the atmosphere. The AVE process is protected by patent applications and could become a major source of electrical energy. The unit cost of electrical energy produced with an atmospheric vortex engine could be half the cost of the next most economical alternative. A vortex engine is a machine for producing and controlling a tornado-like vortex. 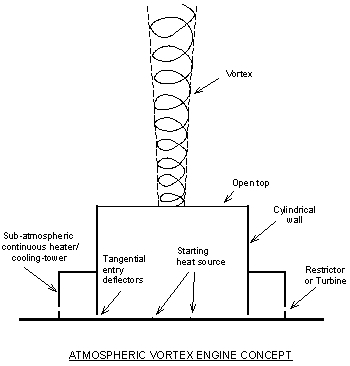 A vortex engine consists of a cylindrical wall open at the top and with tangential air entries around its base. Heating the air within the wall using a temporary heat source such as steam starts the vortex. 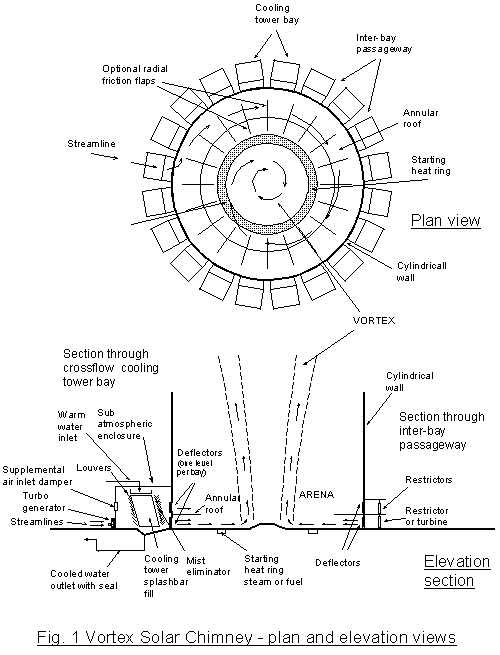 The heat to sustain the vortex once established is provided in cooling tower bays located outside of the cylindrical wall and upstream of the deflectors. The continuous heat source for the peripheral heat exchanger can be waste industrial heat or warm seawater. The intensity of the vortex is regulated by restricting the flow of air with dampers located upstream of the deflectors. The vortex can be stopped by restricting the airflow to deflectors with direct orientation and by opening the airflow to deflectors with reverse orientation. Electrical energy is produced in turbo-expanders located in the inlet to the cooling tower bays. The pressure at the base of the vortex is less than ambient pressure because of the buoyancy of the rising air. The pressure in the cooling tower bays is sub-atmospheric because the cooling bays exhausts at the base of the vortex. The Atmospheric Vortex Engine has the same thermodynamic basis as the solar chimney. The physical tube of the solar chimney is replaced by centrifugal force in the vortex and the atmospheric boundary layer acts as the solar collector. The average upward convective heat flux at the bottom atmosphere is 150 W/m2, one sixth of this heat could be converted to work while it is carried upward by convection. The heat to work conversion efficiency of the atmospheric heat to work conversion process is approximately 15% because the heat is received at an average temperature of 15 C and given up at an average temperature of -15 C. The average work that could be produced in the atmosphere is therefore 25 W/m2. The total mechanical energy produced in the atmosphere is 12000 TW (25 W/m2 x 510 x 1012 m2) whereas the total work produced by humans is 2 TW. The quantity of mechanical energy which could be produced in the atmosphere is 6000 times greater than the mechanical energy produced by humans. Producing and capturing the work requires that the expansion process be carried out at mechanical equilibrium. Without a mechanism, such as a turbine, to capture the work of expansion and to ensure that the process is carried out at mechanical equilibrium, the mechanical energy is dissipated and lost. Atmospheric scientists call the mechanical energy that would be produced if a unit mass of air were raised reversibly from the bottom to the top of the troposphere Convective Available Potential Energy (CAPE). CAPE during periods of insolation or active convection is typically 1500 J/kg which is equal to the mechanical energy produced by lowering a kilogram of water 150 m. It is proposed that a vortex could transfer the mechanical energy down to the Earth's surface where it would be captured. The process could provide large quantity of renewable energy, could alleviate global warming, and could contribute to meeting the requirements of the Kyoto protocol. The AVE has the potential of providing precipitation as well as energy. There is reluctance to attempt to reproduce a phenomena as destructive as a tornado, but controlled tornadoes could reduce hazards by relieving instability rather than create hazards. A small tornado firmly anchored over a strongly built station would not be a hazard. The AVE process could capture the work dissipated by friction in updrafts and the mechanical energy not produced because the expansion process is not carried out in mechanical equilibrium and not just the horizontal wind energy captured by conventional wind turbines. 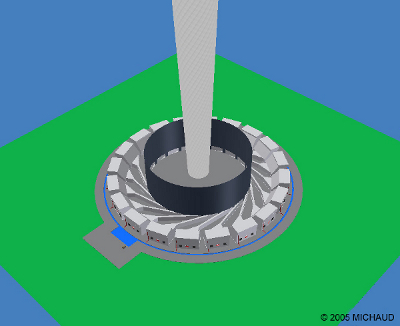 It is estimated that it would be possible to establish a self-sustaining vortex to demonstrate the feasibility of the process with a station 30 m in diameter under ideal conditions. Learning to control large vortices under less than ideal conditions would be a major engineering challenge. Developing the process will require determination, engineering resources; and cooperation between engineers and atmospheric scientists. There will be difficulties to overcome, but they should be no greater than in other large technical enterprises. Submitted by Anonymous (not verified) on February 14, 2007 - 20:19. Have the components of wind shear addressed? Submitted by Anonymous (not verified) on January 23, 2006 - 18:41.